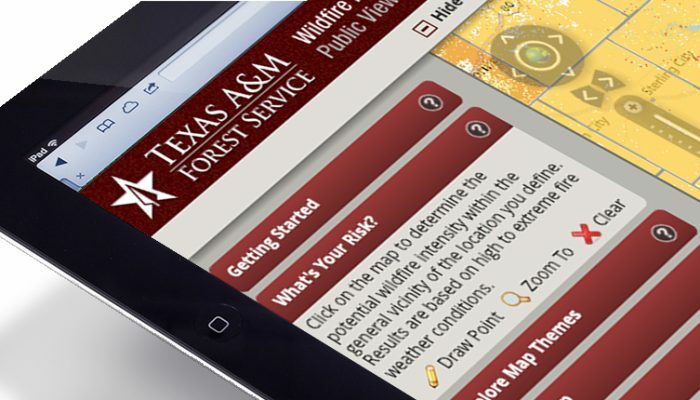 The Texas A&M Forest Service has partnered with Timmons Group, a national geospatial solutions firm, to develop the Texas Wildfire Risk Assessment Portal (TxWRAP). TxWRAP is a web and mobile application that combines a suite of web-mapping applications to make wildfire risk information and planning tools readily available to the public and Texas state and local agencies. According to TxWRAP, over half of Texas is at a moderate to high risk of wildfires. The new TxWRAP Community Assessor application is used by TFS Wildland Urban Interface (WUI) coordinators and local fire departments to set up assessment projects for Texas cities and counties, delineate community boundaries within a project jurisdiction, assign team members to projects, conduct wildfire risk assessments for those communities while out in the field, and produce data and reports used in developing Community Wildfire Protection Plans (CWPPs). Historically, TFS planned, coordinated, and conducted its work manually with local fire departments and homeowners’ associations, primarily relying on paper forms and non-digitial maps. With the role-based Community Assessor, communities like yours can be mapped and evaluated by assessors for wildfire risk without connectivity. The Community Assessor web application allows users to download the Single Community Assessment Report as well as a CWPP Report that details all communities for the project, including a map and table with the total hazard rating for each community. Finally, a map layer that shows all the assessed communities symbolized by total hazard rating is available for users of the TxWRAP Public and Professional Viewers. Wildfire Risk Assessment Portals like TxWRAP are designed for community education and used by state foresters to assess their local forests for wildfire risk. To learn more about TxWRAP or other state portals, reach out to Lowell Ballard at lowell.ballard@timmons.com.